Ramps (Allium tricoccum) are a wild growing member of the garlic and onion family that are native to the north and eastern part of North America. They are the most coveted member of the onion and garlic family due to their resistance to cultivation, their ability to be used many ways in the kitchen, and to their short window of availability, typically about 4 weeks in the early spring. They are so coveted that they typically cost between $15 & $20 per pound. Could you imagine paying that much for scallions, leeks, or garlic? Due to the hysteria for ramps their numbers have been reduced to mere fractions of what they once were. The destruction of their habitat due to expanding suburban and rural development coupled with the most unsustainable of unsustainable harvesting practices has taken its toll. In 1995 Quebec outlawed the harvest and sale of ramps. Great Smoky Mountain National Park outlawed the harvesting of them in 2004. As more and more individuals are drawn to the act of foraging I gravely ask that you observe the rules below when you harvest ramps. Sustainably harvesting ramps is of the utmost importance! Wait until the leaves are fully developed, they’ll be about 6 inches long. This typically happens about 2-3 weeks after they first appear. 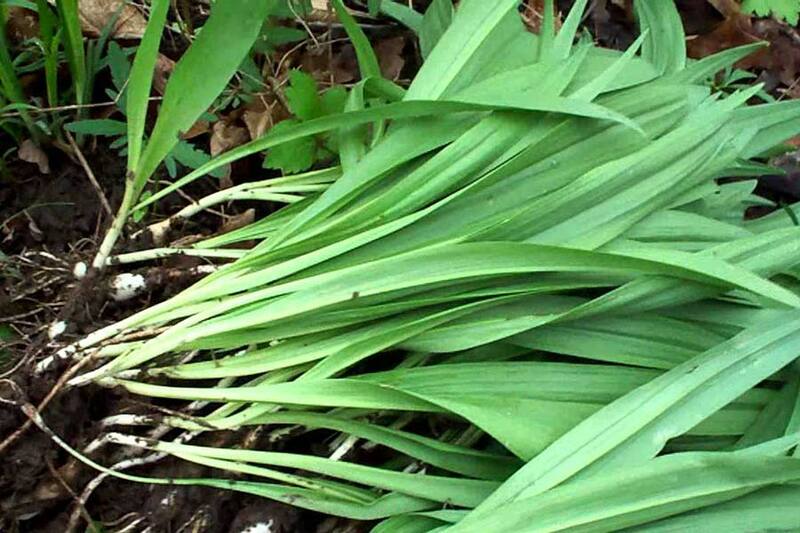 If you can get by without the bulbs the just harvest the Ramps typically have two big leaves. Take one per plant and move on. Ramps will grow in clusters because their seeds fall from the seed heads in clumps. Never harvest more than 10% of a cluster. It can take up to 18 months for a ramp seed to germinate and 5-7 years for a single plant to produce seeds. You’ll be thankful next year when you can harvest them again. Don’t harvest ramps that are flowering or will be flowering. They’re the ones sustaining the next generation. You can easily see the emerging or existing flower stalk. Be mindful of the fact that you’re not the only one out looking for and harvesting ramps. If an area looks like it has already been harvested from then go elsewhere. You don’t double dip at the bowl of salsa. Don’t do double dip in the forest. Be light on your feet. Soil compaction, when the soil gets heavily compressed, can inhibit the growth of ramps and other plants. The less you walk through an area the better. Don’t use tools! Many people go out in the woods with a shovel or spade and dig up whole clusters. This is incredibly destructive and unsustainable. Ramps like to grow in humus, a type of soil that has lots of organic content and is very light and loose. You should be able to gently dig up what you need with just your fingers. You’ll also avoid cutting the roots and rhizomes of other ramps, plants, and trees and won’t leave holes in the ground. Be sure to replace any soil and leaf litter that you disturb. Don’t take more than you can use or sustainably sell. We can all get carried away with the romance of providing food for our tables and making a little extra money. Use restraint and only take what you and others will certainly use. Don’t pay exorbitant prices for them. By paying $20 per pound you only further feed the frenzy. This may mean skipping out on them for a season but the wait will be worth it. Be respectful of local laws and the land. If it’s against the law to remove plants from an area then don’t. If you get caught we all look bad. Don’t make foragers look like pirates. Don’t litter. I constantly see cigarette butts, water bottles, and plastic baggies in the forest. I don’t like having to clean up after you. These are the rules my colleagues and I hold ourselves to. We all love ramps and would like our grandchildren to be able to fall in love with them too. By employing sustainable harvesting practices when foraging you ensure that we all can enjoy foraging the wild world.